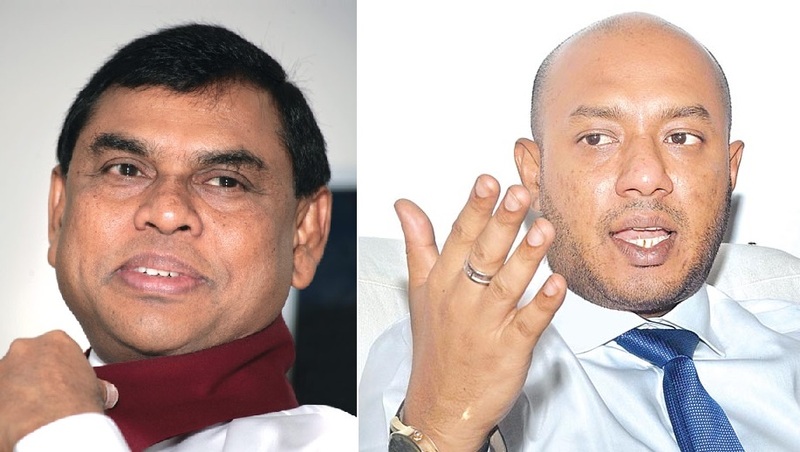 Home Basil Rajapaksa Duminda Dissanayake Top Duminda rejects Basil : Refuses to be part of illegal government. Duminda rejects Basil : Refuses to be part of illegal government. National Organizer of the Sri Lanka Freedom Party (SLFP) Duminda Dissanayake has rejected an offer to join the illegal government that is being formed following a constitutional coup. According to reports, a group led by Basil Rajapaksa had visited Duminda at his home yesterday (31) and engaged in a three-hour-long meeting. However, the discussion had ended without any success as Basil had been left helpless faced by the questions put to him by Dissanayake. Basil left speechless facing Dissanayake’s questions! During the discussion, Duminda had questioned the political future of SLFP members of the Maithree faction. According to reports, the Minister had wanted to know during next provincial council or general elections if they would have to contest under the SLFP, United People’s Freedom Alliance (UPFA) or the Sri Lanka Podujana Peramuna (SLPP). Basil had been completely stumped by these questions and was unable to provide a satisfactory answer. Instead, he had said that the current issue at hand should be resolved and the issue of which party to contest under can be looked at later, adding that he would accept the responsibility of Dissanayake. Cannot decide by thinking of my self alone! However, Minister Duminda Dissanayake had said no one needs to take responsibility for him and that he only needs to know the fate of those who have been loyal to him from local governments, provincial councils, seat organizers and SLFP members in the ground level. Basil had however continuously said it is a matter that can be resolved later as they should now focus on the question at hand adding that Dissanayake should agree to this as President Sirisena too had agreed to this arrangement. However, Duminda had rejected this stating that he does not intend to contest under any party other than the SLFP or the UPFA. He had also stressed that he is unable to take a decision thinking only about himself without knowing the fate of his supporters. Dissanayake had refused to take any position in the current government while also asking Basil to please return to wherever decisions are being made and to only come back with proper answers to his questions. Seven others refuse positions as well! Meanwhile, apart from Dissanayake, seven other SLFP Ministers and MPs have also rejected positions in the new government. According to them, they are not satisfied with the way things are going and will, therefore, remain independent. According to them, they are highly concerned about the positions and organizers posts currently being held by them within the SLFP in case they have to contest under the SLPP banner as well as its impact on their voter base.